Starring: Kate Mara, Anya Taylor-Joy, Rose Leslie, Michael Yare, Toby Jones, Chris Sullivan, and more. I do love September and October for the movie season, and why? Horror/thriller movies. The trend is evident in my reviews, I watch almost any and all horror movies for the slim hope that one will surprise me and entertain me enough for me to love it. Clearly, this method is unsuccessful most of the time but it is a fun process, nonetheless. 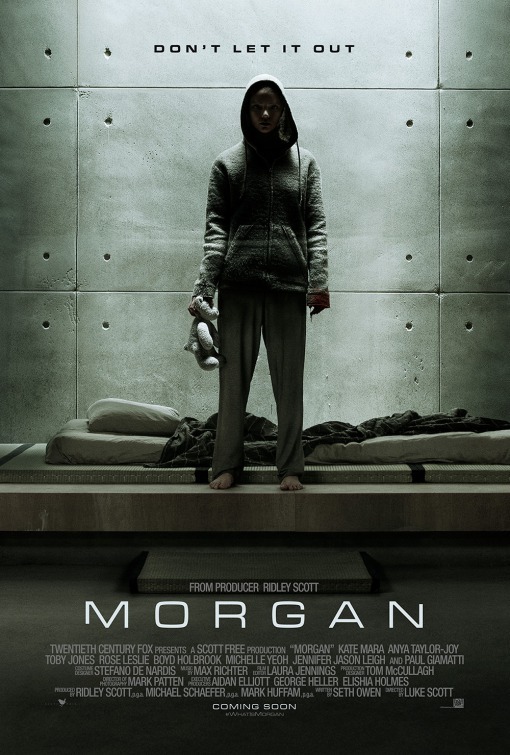 On September 2, 2016, the horror/sci-fi thriller ‘Morgan’ was released. With a mostly unknown presence to the general public, let us see how ‘Morgan’ fared against an Oberrated review. When an artificially made humanoid, Morgan (Anya Taylor-Joy) (Humanoid – having human characteristics or form; resembling human beings.) has an incident during an interaction with one of her friends/scientists, a risk-management consultant, Lee Weathers (Kate Mara), must examine Morgan and make a call to either continue the project or cancel it. As examination begins and progresses, Morgan becomes dangerous to contain, leading to chaos. Ah, I wanted to love this one, I really did, but there is one major thing that a friend of mine said that is as true as it could possibly get. My buddy Grant said, “If ‘Ex Machina’ didn’t exist, this would have been a great movie.” Bold it, italicize it, put it up on the header, scream it off the U.S. Steel tower dahntahn. In my opinion, ‘Morgan’ was simply ‘Ex Machina’ but altered around with minor plot changes and way more brutal. So what does this mean? Well, I LOVED ‘Ex Machina’. It still goes down as one of my favorite movies, ever. ‘Morgan’, by the end of the movie, was way too much like ‘Ex Machina’. Resulting in me feeling as if it was too much of a cop out to creating something original and working off of something that was done well, yet add brutality and action to it. Now with that being the second time of me bringing up the brutality aspect of the film up, ‘Morgan’ was a hell of a brutal movie. I did enjoy that within this film. But again, too much like ‘Ex Machina’. I have seen this before and done better, might I add. Aside from the ‘Ex Machina’ comparison again, the acting was done quite well for what was given. I especially enjoyed Anya Taylor-Joy in ‘The Witch‘ and she was especially cold and unforgiving as Morgan. The rest of the cast were great as well. It is not a jump scare horror, it is not a hold your breath thriller. It is an in-your-face, sub-par Sci-Fi flick. Definitely worth a watch, ESPECIALLY if you have not seen ‘Ex Machina’ (Which I must say, go do now).